John SUTHERS (I) was born circa 1770, possibly in Heptonstall, the parish of Halifax, UK. John Suthers was a weaver by profession. James SUTHERS (I), 1795, Heptonstall, UK. James SUTHERS (I) was born circa 1795 possibly in Heptonstall, the parish of Halifax, UK. James (I) was married previously and a widower before marrying Hannah STOTT 3 November 1840, Parochial Chapel, Heptonstall, Parish of Halifax. Marriage Certificate. James' occupation is listed as weaver on the marriage certificate. In 1841, James and Hannah were living in Wheatshaw, Todmorden with nieces Grace STOTT (aged 10) and Mary STOTT (aged 4). James died 6 December 1842, Tankard Hall, Todmorden of pleurisy. John SUTHERS (II), 1841, Todmorden, UK. James SUTHERS (II), 1843, Todmorden, UK. John SUTHERS (II) born 5 September 1841, Todmorden, UK. John married Selina LEACH, 4 August 1866, Holcombe, Bury, Lancashire. He died 1876. Albert SUTHERS (I), 1869, Ramsbottom, Lancashire, UK. Mary Ann SUTHERS, 1876, Holcombe, Bury, Lancashire, UK. James SUTHERS (II) born 21 July 1843, Tankard Hall, Todmorden, UK. Birth Certificate. James (II) married Sophia RUSHWORTH 11 March 1865, Parish Church, Leeds, UK. Marriage Certificate. Sophia Rushworth was born circa 1842 in Leeds and died May 1891 at the age of 49. She was buried 5 May 1891, Leeds Corporation Cemetery, Beckett Street, grave #2403. In 1871, James was a weaver boarding in Langfield, Todmorden. In 1881 James, Sophia and their 4 children were residing at 34 Butterfield+, Leeds. A nephew, John Swithenbank (aged 13), is also living with them. In 1891 James, Sofia and 3 of their children are residing at 12 Gough St, Leeds. John SUTHERS (III), 1865, Leeds, UK. James SUTHERS (III), 1867, Leeds, UK. Mary Rushfirth SUTHERS, 1870, Leeds, UK. Edward SUTHERS, 1871, Leeds, UK. James SUTHERS (II) married his second wife Sarah Ellen SIMPSON (nee EMMERSON) 27 January 1894, Church of All Saints, Leeds, UK. Marriage Certificate. Sarah Ellen EMMERSON was born 21 November 1860, Leeds, UK. At the time of their marriage James and Sarah were both residing at Shannon Street, Leeds. Map. Shannon Street (3A-B), Butterfield (3B). She was the daughter of William EMMERSON and Anne JOHNSON. This was her second marriage. Her first marriage ended with the death of her husband and their 3 children from TB. In 1901, James and his second wife, Sarah Ellen, resided at 85 York Street with the two oldest boys, Albert and Walter. Albert SUTHERS (II), 1894, Leeds, UK. Walter SUTHERS, 1896, Leeds, UK. Ernest SUTHERS, 1903, Leeds, UK. James died October 1909 at the age of 64 (this age is 2 years younger than what his birth certificate said). At the time of James' death he lived at 18 Spring Street, Leeds, and his occupation was listed as coal merchant (we understand he was self-employed). James was buried on 5 Oct 1909, Leeds Corporation Cemetary, Beckett Street, Leeds, UK. Albert SUTHERS (I) born 12 August 1869, Ramsbottom, Bury, Lancashire, UK. Albert married Mary Hannah (Ann) ISHERWOOD, 1893, Bury, Lancashire, UK. Mary Hannah was born 1870, Bury, Lancashire, UK. Albert died at age 46 in 1915. Oswald SUTHERS, 1893, Bury, Lancashire, UK. John SUTHERS (III) was born 1865/3Q, Leeds, UK. In the 1891 census, John was living at 38 Royd's Street in Milnrow with James Stott and family. 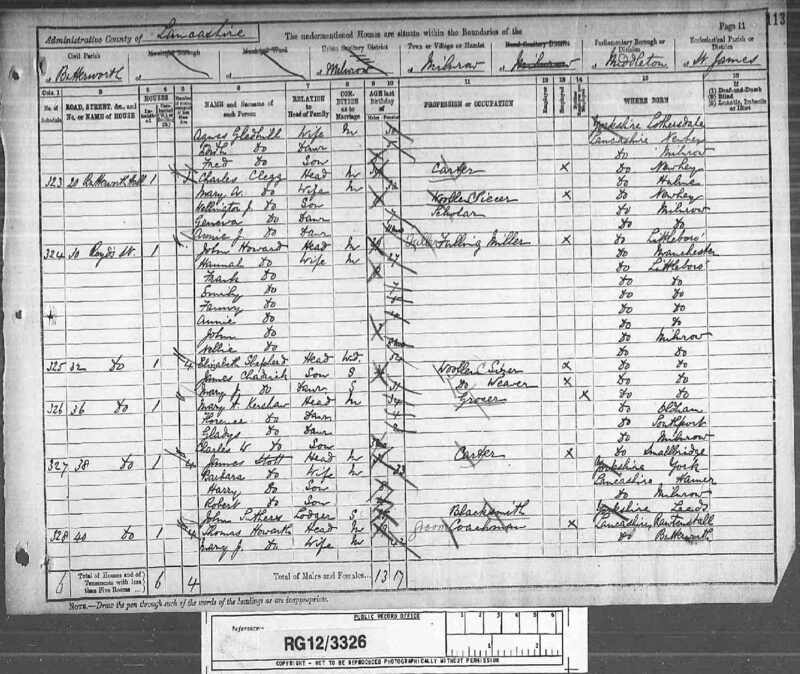 The 1901 census, John is living with James Stott and family still. This could be a relative of his as his grandmothers was a Stott. James SUTHERS (III) was born 1867/3Q, Leeds, UK. James died in February 1899, aged 29 (his age listed is different from his birth record). He was buried 11 Feb 1899, Leeds Corporation Cemetary, Beckett Street, Leeds, grave #2909. At the time of James' death he was at Walsh Row, Meanwood Road, Leeds, and his occupation was listed as engine tacker. We're not sure if he ever married. Mary Rushfirth SUTHERS was born circa 1870, Leeds, UK. Mary married William MYERS, 20 May 1896, All Saint's Parish Church, Leeds Marriage Certificate. William Myers was a bootmaker at the time of their marriage. Edward SUTHERS was born 20 Sept 1871, Leeds, UK. Edward SUTHERS married Rhoda BOWATER, 1895/4Q, Leeds. UK. Rhoda was born September 1876 and died 14 October 1918, aged 42, and was buried 17 October 1918. At the time of Rhoda's death she lived at 31 Grove Street, Leeds. Both Edward and Rhoda are buried in grave #2404 at Leeds Corporation Cemetary, Beckett Street, Leeds, UK. Elsie SUTHERS, 1896, Leeds, UK. Alfred SUTHERS, 1898, Leeds, UK. Wilfred SUTHERS, 1899, Leeds, UK. Edward married Zillah Mabel Lavinia VARLEY 1 Aug 1926, Kingston Upon Hull, Yorkshire. Edward died 19 December 1944, at the age of 73, and was buried December 23, 1944 At the time of Edward's death he lived at 7 Vickers Avenue, Leeds and was an engineer. Albert SUTHERS (II) was born 2 January 1894, Leeds, UK. Albert married Emma WILSON in 1917/1Q. Emma was born 31 August 1890 in Leeds, England. She died on 16 August 1973 in Sydney, Australia and Albert died 12 April 1983 in Sydney, Australia. Albert and Emma emigrated to Australia. John Albert SUTHERS (IV), 1915, Leeds, UK. Walter SUTHERS was born June 27, 1896, Leeds, UK. Walter joined the Army when he was 18. Walter SUTHERS married Ethel GAUNT (nee BROWN) April 3, 1920, Leeds, UK. Marriage Certificate. Ethel Brown was the daughter of William Tipling Brown and Mary Hannah Cass of Bramley, UK. She was born in 1890 in Bramley, UK. Walter and Ethel emigrated to Hamilton, Ontario, Canada 15 August 1920 on the S.S. Cormann which departed from Liverpool on the 6 August 1920. Walter is described as 5 feet 5 inches, dark complexion, brown eyes and dark brown hair. Walter was a carpenter working for Westinghouse. Walter and Ethel purchased a house located at 22 Fraser Avenue, Hamilton, Ontario during 1923. Walter died 15 December 1964 aged 68 years in Hamilton, Ontario, Canada. Ethel died 9 May 1978 aged 87 years in Hamilton, Ontario, Canada. They are both buried at Whitechapel Cemetary, Hamilton, Ontario in Grave 85, #1. Donald SUTHERS, 1922, Hamilton, Ontario, Canada. Harold SUTHERS, 1923, Hamilton, Ontario, Canada. Roy Frederick SUTHERS, 1926, Hamilton, Ontario. Ernest SUTHERS was born 10 April 1903, Leeds, UK. Ernest died 4 May 1982, at age 79. Ernest SUTHERS married Janet WILKINSON December 24, 1924 at Saint Saviours Church in Leeds, UK. Oswald SUTHERS was born 1893 in Bury. Oswald married Alice WRIGLEY in 1922, Oldham. He died at age 69 in 1962, Oldham. Elsie SUTHERS was born 19 July 1896, Leeds, UK. She married Fred JAMES July 23, 1921 in Leeds, England. Elsie died 19 April 1986. Vera SUTHERS, 1929/4Q, Leeds, UK. Wilfred SUTHERS was born 3 November 1899, Leeds, UK. Wilfred marrid Dorothy (Dolly) BRUNTON July 23, 1921. Wilfred died 11 January 1990. Richard SUTHERS, 1924/1Q, Bramley, UK. Edward SUTHERS, 1930/1Q, Leeds South, UK. John Albert SUTHERS (IV) was born 22 September 1915 in Leeds, UK. He died on 3 November 1994 in Sydney, Australia. John Albert married Elsie Anges LJUNGBERG in December 31, 1936 in Auburn, Sydney, Australia. Elsie was the daughter of Oscar Ljungberg and Ethel May Beer (Hunt). Lynette SUTHERS, 1950, Sydney, Australia. Karleen SUTHERS, 1952, Sydney, Australia. James SUTHERS (IV) was born 3 October 1920 in Sydney, Australia. James married Joyce MCCAULEY on January 19, 1946 in Sydney, Australia. Sylvia SUTHERS was born 2 January 1925 in Sydney, Australia. Sylvia married Frederick KEARNEY on January 5, 1946. Donald SUTHERS was born 13 July 1922 in Hamilton, Ontario. He married Marie-Jeanne Cecile PROVENCHER June 1944, Ottawa, Canada. Cecile was born 10 December 1913 in Manchester, NH. Donald died 31 January 1998 in Burlington, Ontario. Cecile died 3 November 2005 in Burlington, Ontario. Mark Spencer SUTHERS, 1944, Hamilton, Ontario, Canada. Susanne Marie SUTHERS, 1946, Hamilton, Ontario, Canada. Donna Michele SUTHERS, 1953, Hamilton, Ontario, Canada. Margaret Lynn SUTHERS, 1957, Hamilton, Ontario, Canada. Harold SUTHERS was born 24 October 1923 in Hamilton, Ontario, Canada. Harold was a Flight Sergeant Air Gunnner for the 463 RAAF Squadron. On 29 January 1944, Harold and the rest of the crew never returned from their mission. He was 21 years of age. Harold is buried at Jutland Aabenraa Cemetery, Denmark, Grave 4-20A. Roy Frederick SUTHERS was born 18 November 1926, Hamilton, Ontario, Canada. Roy Frederick joined the Navy in 1945. He was an aircraft mechanic. Roy served in the Canadian Navy for 20 years. He married Elizabeth Patricia TIERNEY 27 March 1948, Glasgow, Scotland. Elizabeth was born 11 March 1927, Glasgow, Scotland and is the daughter of Terence Tierney and Susan Collins Ward Tierney, Glasgow. Susanne Louise SUTHERS, 1949, Glasgow, Scotland. Michael Owen SUTHERS, 1950, Halifax, Nova Scotia, Canada. Laura Christine SUTHERS, 1951, Halifax, Nova Scotia. Roy Gary SUTHERS, 1953, Halifax, Nova Scotia. Linda Lee SUTHERS, 1956, Halifax, Nova Scotia. Teresa Lorraine SUTHERS, 1959, Halifax, Nova Scotia. Patricia Lenore SUTHERS, 1960, Halifax, Nova Scotia. James SUTHERS (V) was born 20 April 1925, Leeds, UK. James was a sergeant in the mounted police in Birmingham, Warwickshire. James died 28 December 1986 while shovelling snow from a heart attack at age 61. James married Doreen ALLEN in 1947, All Saints Church, York Road. Irene SUTHERS was born 11 September 1926, Leeds, UK. Irene married John Randel RODGER. Dorothy SUTHERS, 1928, UK. Dorothy married Marion STANKOWICZ who later had his name legally changed at Leeds Registry Office to STANTON September 10, 1948. Adrian STANTON, 1950, Leeds, UK. Janet STANTON, circa 1950, Leeds, UK. Wendy Irene STANTON, 1960, UK. Joyce SUTHERS, 1933, UK. This will be updated later. Dennis SUTHERS was born 5 Feb 1923 in Oldham, Lancashire. Dennis married Eleanor SORSBY. Dennis died January 1975 in Oldham at the age of 51. Kathryn E. SUTHERS, 1951, Ashton. Dorothy SUTHERS was born 1925 in Oldham, Lancashire. Dorothy married Harry LEES in 1951, Middleton. Rhoda JAMES was born (? ), UK. David JAMES was born (? ), UK. Margaret JAMES was born (? ), UK. Vera SUTHERS was born 1929/4Q, Leeds, UK. Vera was a teacher and married a journalist from Antipodes. Vera is now divorced and returned to England to become Headmistress at Barwick Infants School. Richard SUTHERS was born 21 January 1924, Bramley, UK. Richard married Duclia WEBSTER. Richard died July 2000, Wakefield, UK. Gloria SUTHERS was born circa 1940, Australia. Gloria married Ashley HILL in ---?. Pauline Nicole SUTHERS, 1984, Perth, Ontario, Canada. Sharyn Marie-Jeanne SUTHERS, 1989, Perth, Ontario, Canada. Susanne Marie SUTHERS was born 25 January 1946, Hamilton, Ontario, Canada. Susanne married Rene Richard LESSARD 31 August 1968 at St. Raphaels Church, Burlington. Rene was born 29 April 1943, Bethel, Conneticut. Donna Michele SUTHERS was born 31 December 1953, Hamilton, Ontario, Canada. Michele married Alfred John PURDY August 7, 1976 in Hamilton, Ontario. John was born 31 August 1951 in Belfast, N. Ireland. Ryan Christopher PURDY, 1981, Brantford, Ontario, Canada. Matthew Thomas PURDY, 1983, Brantford, Ontario, Canada. Margaret Lynn SUTHERS was born 15 August 1957, Hamilton, Ontario, Canada. Lynn married John Simpson RUSNAK on May 12, 1979, Burlington, Ontario. John was born 10 October 1951, Hamilton, Ontario and is the son of Ivan Rusnak and Katherine Buglass Rusnak. Lesleigh Breanne RUSNAK, 1986, Hamilton, Ontario, Canada. Jaclyn Marie RUSNAK, 1988, Hamilton, Ontario, Canada. Jennifer Leigh RUSNAK, 1993, Hamilton, Ontario, Canada. Susanne Louise SUTHERS was born 20 January 1949, Glasgow, Scotland. Sue married Gordon MACKAN in 1972. Sue and Gord divorced in 1974. Sue married Terrence Rowland BROOKS in 1976. Michael Owen SUTHERS was born 2 April 1950, Halifax, Nova Scotia, Canada. Michael married Ann MINNIE (nee GRAHAM), 6 November 1992, Burlington, Ontario. Ann was born 20 December 1954. Jacob Fredrick MINNIE, 1976, Burlington, Ontario. Brooke Ann MINNIE, 1979, Burlington, Ontario. Carrie Lee MINNIE, 1980, Brantford, Ontario. Laura Christine SUTHERS was born 15 November 1951, Halifax, Nova Scotia, Canada. She likes to be called Chris. Adam Nicholas SUTHERS, 1978, Burlington, Ontario, Canada. Roy Gary SUTHERS was born 14 July 1953, Halifax, Nova Scotia, Canada. Roy Gary SUTHERS married Barbara Ann FULLER April 24, 1987. Elizabeth Anne SUTHERS, 1989, Oakville, Ontario, Canada. Linda Lee SUTHERS born 30 October 1956, Halifax, Nova Scotia, Canada. Linda Lee SUTHERS married Derrick ESPEUT February 25, 1977, Toronto, Ontario, Canada. Derrick Espeut was born 9 April 1950, Trelawny, Jamaica. Patrick Derrick ESPEUT, 1977, Toronto, Ontario, Canada. Nicole Leigh ESPEUT, 1978, Toronto, Ontario, Canada. Lindsay Marie ESPEUT, 1983, Mississauga, Ontario, Canada. Teresa Lorraine SUTHERS was born 7 January 1959, Halifax, Nova Scotia, Canada. Patricia Lenore SUTHERS born 9 April 1960, Halifax, Nova Scotia, Canada. Patricia Lenore SUTHERS married Robert Malcolm VEZINA August 22, 1987, Ottawa, Ontario, Canada. Robert Vezina was born 27 September 1960 in Montreal, Quebec. Cara Rachelle VEZINA, 1992, Ottawa, Ontario, Canada. Shannon Leigh VEZINA, 1995, Ottawa, Ontario, Canada. Valerie Ann SUTHERS, 1971, Birmingham, UK. Barry Ian SUTHERS, 1974, Birmingham, UK. Christine Elizabeth RODGER was born 3 January 1948, Worksop, Notts., UK. Christine married Frank Leigh BIDDLE. Angela Christine Jeanette Biddle, 1969, UK. Sarah June Ellen Biddle, 1970, UK. Robert Leigh Biddle, 1971, UK. Lynne RODGER was born 1949, UK. Lynne married (?) FOX. John Robert RODGER was born 1950, UK. John Robert moved to Rhodesia, South Africa sometime in the 1970's and has lived there since. Adrian STANTON was born 22 March 1950, Leeds, UK. Adrian married Jennifer HUNTER on 31 August 1968. Jennifer was born 20 June 1950. Louise M. Stanton, 1972, UK. Andrea (? ), circa 1970, UK. Mathew HIRST, circa 1970, UK. Felicity (? ), circa 1970, UK. David STANTON was born 5 August 1959, Canada. Wendy Irene STANTON was born 1960, Leeds, UK. Wendy married (?) BROWN. Pauline Nicole SUTHERS was born 7 November 1984, Perth, Ontario, Canada. Nicole loves swimming and playing the piano. Sharyn Marie-Jeanne SUTHERS was born 29 March 1989, Perth, Ontario, Canada. Sharyn enjoys swimming and playing the piano. Candace Hope LESSARD was born 23 September 1970 in Manchester, Conneticut. Candace married Mark Andrew GAYOWSKY 28 August 1993 in Burlington, Ontario. Anastasia (Anna) Marie GAYOWSKY, 1994, Hamilton, Ontario. Tatiana (Tia) Rose GAYOWSKY, 1996, Hamilton, Ontario. Ronald Cameron GAYOWSKY, 1998, Hamilton, Ontario. Sean LESSARD was born 12 January 1973, Burlington, Ontario. Robin LESSARD was born 19 November 1974, Burlington, Ontario. Robin married Robert NEILSON on 29 September 2000. Ella Cecile NEILSON, 2002, Burlington, Ontario. Wyatt William NEILSON, 2004, Burlington, Ontario. Ryan Christopher PURDY was born 13 June 1981 in Brantford, Ontario. Matthew Thomas PURDY was born 27 April 1983 in Brantford, Ontario. 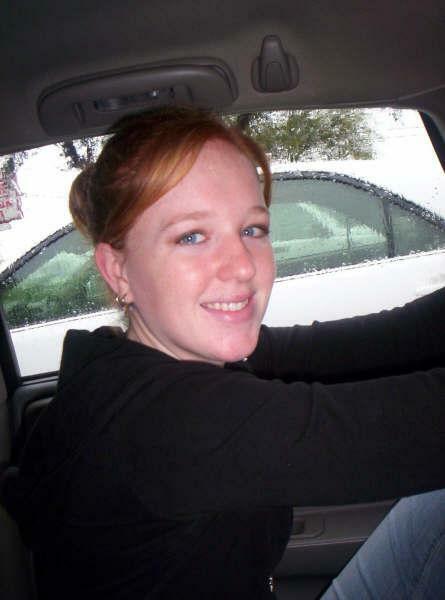 Lesleigh Breanne RUSNAK was born 3 April 1986. Jaclyn Marie RUSNAK was born 26 May 1988. Jennifer Leigh RUSNAK was born 24 November 1994. Jacob Fredrick MINNIE was born 11 March 1976, Burlington, Ontario. Jacob married Lisa Diane HODGSON, 17 August 2002. Lisa was born 1 January 1980, Oakville, Ontario. Elora Anne MINNIE, 2003, Oakville, Ontario. Brooke Ann MINNIE was born 1 February 1979, Burlington, Ontario. Carrie Lee MINNIE was born 24 September 1980, Brantford, Ontario. Carrie married Paul Huibert Jan BAAYEN on 28 August 2004, Burlington, Ontario. Paul was born 24 November 1964, Grave, Noord Brabant, Holland. Adam Nicholas SUTHERS was born 14 October 1978, Burlington, Ontario, Canada. He recently graduated from Cambrian College in Sudbury, Ontario. Adam is engaged to LauraAnn STEVENS. LauraAnn was born 11 June 1977. Emma Ann STEVENS-SUTHERS, 2002. Photo. Spencer Addison STEVENS-SUTHERS, 2004. Photo. Patrick Derrick ESPEUT was born 21 September 1977, Toronto, Ontario, Canada. Patrick graduated from the University of Toronto in the Commerce program, June 2002. Patrick is 6 feet 3 inches tall and loves to play basketball. Brayden Miguel Espeut PEREIRA, 2004. Photo. Lindsay Marie ESPEUT was born 26 September 1983, Mississauga, Ontario, Canada. Lindsay will be starting at the University of Toronto September 2002 in the Sociology Department. She loves gymnastics. Cara Rachelle VEZINA was born 10 November 1992, Ottawa, Ontario, Canada. Shannon Leigh VEZINA was born 7 February 1995, Ottawa, Ontario, Canada. Lisa SUTHERS was born 4 October 1871, UK. Isabella May SUTHERS, 2001, UK. Alexander SUTHERS was born (? ), UK. Valerie Ann SUTHERS was born 10 August 1971, Birmingham, UK. Barry Ian SUTHERS was born 9 May 1974, Birmingham, UK. Angela Christine Jeanette BIDDLE was born 17 January 1969, UK. Angela married Neil David ROBINSON. Damien James Thomas Robinson, 1987, UK. Victoria Hellen Anne Robinson, 1989, UK. Natalie Frances Louise Robinson, 1994, UK. Sarah June Ellen BIDDLE was born 9 June 1970, UK. Sarah married Larry BROWN. Shane Leigh Peter BROWN, 1995, UK. Robert Leigh BIDDLE was born 12 May 1971, Wakefield, UK. Richard STANTON was born 28 February 1969, UK. Richard married Carol Diane BAKER. Richard passed away 24 April 2004. Louise M. STANTON was born 11 March 1972, UK. Louise married Michael PANZARELLA on 19 October 1996. Michael was born 4 January 1967 in Chicago, Illinois. Olivia Frances PANZARELLA, 1997, USA. Camille Grace PANZARELLA, 1999, USA. Dominic Caine PANZARELLA, 2001, USA. Mitchell Ryker PANZARELLA, 2001, USA. Anastasia (Anna) Marie GAYOWSKY was born 20 October 1994, Hamilton, Ontario. Tatiana (Tia) Rose GAYOWSKY was born 15 May 1996, Hamilton, Ontario. Ronald Cameron GAYOWSKY was born 12 July 1998, Hamilton, Ontario. Ella Cecile NEILSON was born 8 October 2002 in Burlington, Ontario. Wyatt William NEILSON was born 2 May 2004 in Burlington, Ontario. Elora Anne MINNIE was born 3 December 2003, Oakville, Ontario. Emma Ann STEVENS-SUTHERS was born 6 January 2002 in Sudbury, Ontario. Spencer Addison STEVENS-SUTHERS was born 4 October 2004 in Sudbury, Ontario. Brayden Miguel Espeut PEREIRA was born 1 October 2004 in Mississauga, Ontario. Isabella May SUTHERS was born 2001, UK. Damien James Thomas ROBINSON was born 30 August 1987, UK. Victoria Hellen Anne ROBINSON was born 15 January 1989, UK. Natalie Frances Louise ROBINSON was born 10 July 1994, UK. Shane Leigh Peter BROWN was born June 1995, Leeds, UK. Olivia Frances PANZARELLA was born 23 June 1997, USA. Camille Grace PANZARELLA was born 18 July 1999, USA. Dominic Caine PANZARELLA was born 15 May 2001, USA. Mitchell Ryker PANZARELLA was born 15 May 2001, USA. Biddle, Angela Christine Jeanette, b.1969-d.
Biddle, Sarah June Ellen, b.1970-d.
Brown, Shane Leigh Peter, b.1995-d.
Minnie, Brooke Ann , b.1979-d.
Minnie, Carrie Lee , b.1980-d.
Minnie, Elora Anne , b.2003-d.
Minnie, Jacob Fredrick , b.1976-d.
Pereira, Brayden Miguel Espeut, b.2002-d.
Robinson, Damien James Thomas, b.1987-d.
Robinson, Natalie Frances Louise, b.1994-d.
Robinson, Victoria Hellen Anne, b.1989-d.
Suthers, Kathryn E. , b.1951-d.
Return to Linda's home page.